It’s the most wonderful time of the year—to celebrate and learn! Our year two Christmas pages bring the joy of the season into the classroom with a variety of activities that will simultaneously educate and entertain your students. In addition to holiday-themed arts and crafts projects, writing exercises, word search puzzles and maths games, there are reading passages that teach students how other countries celebrate Christmas, from Mexico to Russia. How do you know when it's wintertime? Have your child complete this winter writing prompt to exercise writing skills and reinforce seasonal knowledge. This Christmas colour by number will sweeten your holiday festivities. Try our Christmas colour by number with your child between opening gifts and family dinner. There's nothing better than a mug of hot chocolate! Your child can work on his writing skills as he describes how to make a great cup of cocoa. Christmas time is coming! colour in this beautiful Christmas tree and all the presents according to the colour chart. This Santa letter template is great for kids who want a little extra structure when writing to Mr. Claus. Try our Santa letter template this Christmas season. Giving your child gifts for the 12 Days of Christmas? Use these festive 12 Days of Christmas tags to mark each present! Sing along to "Auld Lang Syne" with this festive print, featuring the lyrics to the classic Scottish tune. Ring in the new year with "Auld Lang Syne!" Three full days of Christmas celebration? The holidays season is pretty amazing in Germany! Sing along to the 1, 2, 3 ... 12 Days of Christmas! This festive print features all of the lyrics to the 12 Days of Christmas. Challenge your child's skip-counting skills with this Christmas number adventure! He'll fill in the missing numbers in each pattern. If you're good in Mexico, the Three Wise Men might come on Christmas Day and leave you candy and money! Did you know that you could celebrate Christmas in December and then fly to Russia to celebrate the same holiday in January? Santa left your child a note! Print out these notes from Santa to leave by the cookie plate, on your kid's bulletin board, or in a stocking. Count the 12 Days of Christmas with these holiday gift tags! For a fun twist on a Christmas tradition, give your child a small present on each of the 12 Days. Have you ever heard of Julbock, the Christmas goat, or Tomten, the gift-giving Christmas elf? Learn how to celebrate Christmas in Sweden! 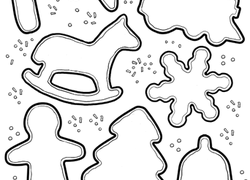 Print out this joy coloring page for your child to colour in during the holiday season. Encourage your child to feel the 'joy' that the holidays bring! Mmmm! Can you smell the Christmas cookies in the oven? Warm up your child's writing skills with this Christmas cookies writing prompt. Write about your Christmas tree with this holiday writing prompt! Kids will describe their favorite things about the classic Christmas decoration. Have your child colour this page of the three Magi as you tell him about Christmas. The three Magi used the stars as their navigation system. Colour your own Christmas cards to make a quick and unique holiday greeting. colour your own Christmas cards to save time and money for holiday fun. This Christmas coloring sheet features blank holiday cookies that need some of your child's creativity and colour. Learn all about Sinterklaas (sound familiar?) and the fun traditions that kids in the Netherlands look forward to every Christmas! Amazing Grace, how sweet the sound! This print features the lyrics to the first verse of the Christian hymn Amazing Grace. "Oh, Christmas tree, oh, Christmas tree..." Does you know the rest of the song? Pretend you're spending the holidays in France as you discover the Christmas customs and culinary delights of a country half a world away!